The Secret Hollywood Tour is a 60 minute Multi Media Walking Experience through the Heart of Hollywood. 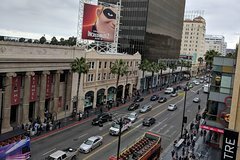 In addition to seeing The Dolby Theater, The Hollywood Sign, The Chinese Theater, and The Roosevelt Hotel you will hear stories, history and accounts that you won't hear on any other Tour. The Secret Hollywood Tour begins at the "Four Ladies of Hollywood" statue at the corner of Hollywood blvd. and La Brea ave. From there we will walk approximately 1.25 miles through the heart of Hollywood. Not only will you go by all the major hot spots but you will hear stories and go to places that no other Tour can access. The Secret Hollywood Tour is a true boutique Tour experience. All groups are a maximum of six participants. Every single Tour becomes a personal experience as we discover Hollywood together. You will never be talked at like a giant group. The Secret Hollywood Tour will be customized just for you. The Secret Hollywood Tour will not only give you the complete history of Hollywood, it will peel away the shiny veneer and really show you what Hollywood has been trying to keep hidden.